On the morning after the presidential election, Hillary Clinton delivered a concession speech in New York, publicly conceding the presidential election to Donald Trump. During this speech, she said exactly what needed to be said in that moment: She reminded everyone that there is a lot of work left to be done, and that nobody should stop fighting for what they believe in. In the early hours of Wednesday, Clinton reportedly called Trump to privately concede first. Trump had surpassed the 270 electoral votes he needed to become president-elect, and he subsequently delivered a victory speech. 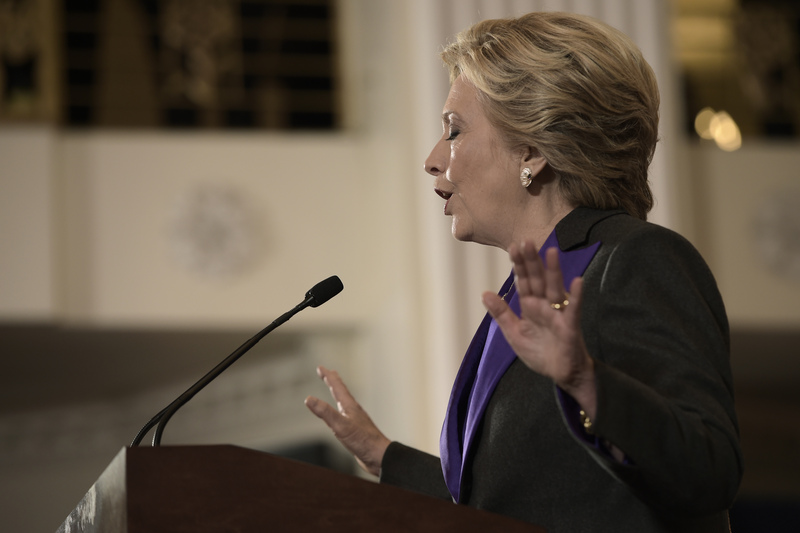 Clinton was initially expected to deliver a speech during the night, when it had become clear that she had failed to acquire the necessary number of electoral votes, but at roughly 2 a.m. ET on Wednesday, John Podesta, her campaign manager, told Clinton supporters that an official announcement would be coming later. The extra time the Clinton campaign took to deliver a public statement seems to have paid off. One could argue that, faced with the idea of a racist, sexist demagogue like Trump as president, Clinton ought to have been more critical of him. However, both she and Sen. Bernie Sanders have been doing that for the past year and a half, and her concession speech was a moment for her to remind Americans across the country that her loss, while painful, was a moment to encourage solidarity. As a leftist, I have not always seen eye-to-eye with Clinton on her politics, but I did not doubt her sincerity when she urged her audience to "never stop believing that fighting for what's right is worth it." She may have encouraged a peaceful transfer of power, and expressed a desire to work with Trump going forward, but her concession speech also contained an important warning: Don't give up just because you are facing the setback of a Trump presidency. The other extremely critical point she made was this one: "Our constitutional democracy demands our participation, not just every four years but all the time." Being politically engaged and socially active demands more than just a vote in a presidential election. It demands that we take action on the ground, and move in solidarity with those who are systemically oppressed. Even and especially when it is not an election year, it is of the utmost importance that we demand justice and solidarity for our communities." People all over the world were watching this election, and the outcome was devastating, especially for all those who Trump threatened, discriminated against, and harassed during his campaign. However, Clinton's concession speech was an important reminder than this election was neither the end nor the beginning of anything; rather, it was a moment whose energy we must seize and harness as a way of taking future action.